There was a post in OTN where OP was looking for Smartcuts of all PDF reports under a folder. I know that you are aware of using urls in Planning Tasklist. So what if I’ve an FR report which I want to show to the user after he is done with his data entry. I can use the Smartcut of the FR/WA report and add that as a URL in tasklist. However it doesn’t work that way. Support asks to use a special url instead to launch the report. If you have special characters in your folder name or report name those should be encoded. What encoding are they talking about? Well it is URL encoding they are referring to, for example if you have a space in the folder then instead of space use %20. I’ve covered that in my SQL, where spaces are replaced with %20. If you are using any other special character, check http://meyerweb.com/eric/tools/dencoder for special character URL encoding. Let’s say that once the report is open and you are now back to Planning tab and trying to navigate to forms folder. When you click on a Forms, you will get a pop-up asking whether to stay on the page or leave the page. Always click on “Stay on Page”. 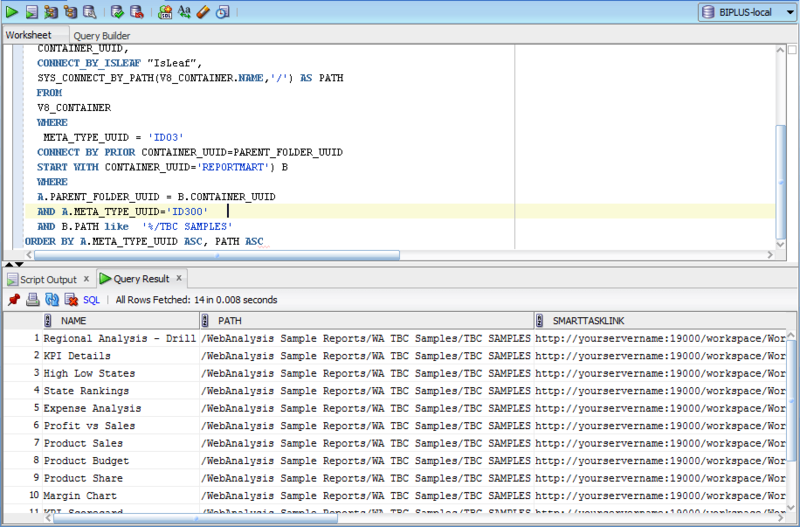 The above given SQL to generate SmartTaskList will not work in 11.1.2.3.500, Oracle changed the way how reports are identified. It is now using UUID (which makes more sense rather than going by path and report name). If you are on 11.1.2.3.500 and trying to generate the url for opening a FR report in Planning tasklist then use the one below. Do you have any information about how-to coding URL statement . I need use %SSO% object, %user_name% and so on. @er77 can you be more specific %SSO% sound like old single sign on method. How am I suppose to run a report/job directly in background mode through smartcut url in EPM workspace. I didn't get run a report in background mode? What exactly are you looking for? If you click on the smartcut then the report will open. Celvin, I'm using EPM 11.1.2.3 and I have to create a link for excel and PDF files and all the users need to access the link to download. I have used directory and UUID to create a link, and I can open the files with both ways in a new tab of IE, but if I use the link into tasklist show error "EPM Workspace cannot function inside a frame". PS: I have selected "use single sing on". “This product could not be displayed because you are using an unsupported browser. Contact your administrator”. When I click OK, the new window opens and gives Bindows error. I don’t think that version is supported in IE11. You’ve to patch your version.